Make this Sankranti festival a joyous one with RummyCircle and win cash prizes worth Rs.10 lakhs over a course of 7 days. Join the special Sankranti Rummy Tournament starting from 11th January and get your tickets to compete in grand finale for a big cash prize of Rs.2 lakhs. You can win up to Rs.1 lakh every day from the qualifiers round from 11th to 16th January. Login and register your seat via your PC or mobile and start playing your ace game! 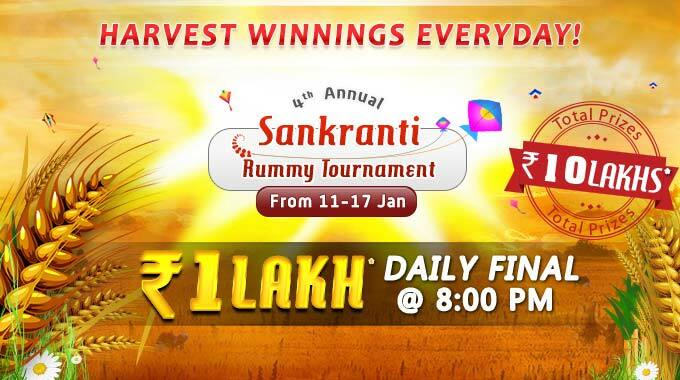 The Sankranti Rummy Tournament from RummyCircle will run from 11th to 17th January 2016. There will be 10 qualifier rounds and 1 daily final every day from which you can win your tickets to Sankranti Rummy Tournament Grand Finale along with cash prizes worth Rs.1 lakh. The top 6 players from each day will move to the grand finale scheduled for 17th January at 3:00 PM. Only the players having a cash rummy account will be eligible to take part in this special Sankranti rummy tournament. To become a cash player, make a minimum deposit of Rs.100 on RummyCircle and play a minimum of one cash rummy game. To know more about this website and their promotions, bonuses, offers and deals, read our review on RummyCircle. If you have any query or feedback on this special festive tourney, post it in the comment section below.